The erroneous coordinates programmed into the Ariane 5’s inertial reference units led the rocket approximately 20 degrees off course from its intended easterly trajectory seconds after liftoff from the Guiana Space Center on the northern shore of South America, officials said. Chaired by Toni Tolker-Nielsen, inspector general of the European Space Agency, the inquiry found that the rocket’s two inertial reference systems were misaligned. Due to “special requirements” for the Jan. 25 mission, the azimuth required to properly align the Ariane 5’s inertial units was 70 degrees, not 90 degrees as is usually the case for launches into geostationary orbit, Arianespace said. 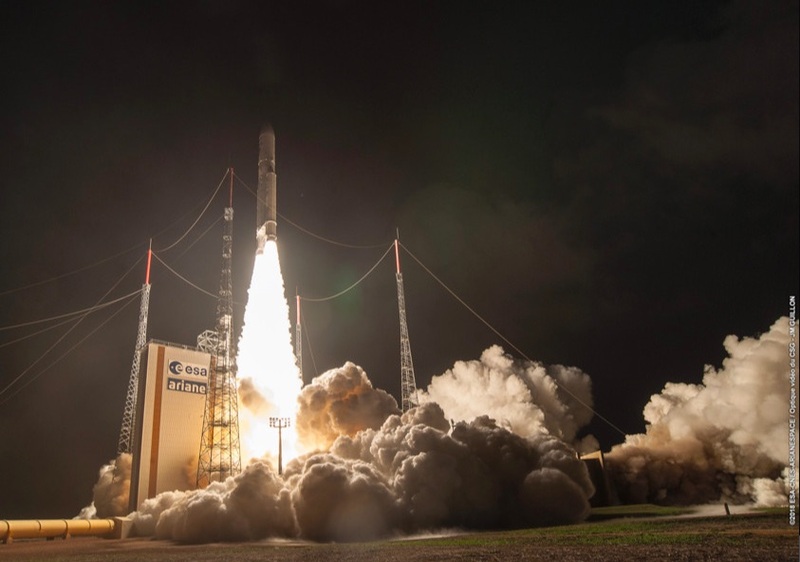 The powerful European-built rocket placed its two payloads — the SES 14 and Al Yah 3 communications satellites — an orbit with a track inclined approximately 20.6 degrees to the equator, not the mission’s planned 3-degree inclination target orbit. Both satellites will consume more fuel than planned to make up off-target launch and place themselves into a circular orbit nearly 22,300 miles (35,800 kilometers) directly over the equator, but spacecraft officials say SES 14 and Al Yah 3 will be salvaged to commercial service later this year. Engineers at the spaceport near Kourou, French Guiana, lost contact with the Ariane 5 rocket around 9 minutes, 26 seconds, after liftoff as the launcher flew outside the range of a tracking antenna located near the tropical launch base. Downrange tracking stations in Brazil, Ascension Island, Gabon and Kenya never established contact with the Ariane 5, which continued flying on the unexpected heading over the Atlantic Ocean, then over Africa. The downrange ground stations were commanded to point their antennas toward the Ariane 5’s expected location, not its actual position. Arianespace announced the launch had encountered an anomaly after the time of the expected deployment of the SES 14 and Al Yah 3 satellites, when controllers had never regained contact with the rocket. Satellite operators received signals from SES 14 and Al Yah 3 later that night, confirming their health and orbits after earlier fears the spacecraft may have been lost. Tracking data indicated the Ariane 5 placed the satellites into an orbit ranging in altitude from approximately 144 miles (232 kilometers) to a high point of around 26,800 miles (43,200 kilometers), not far below the mission’s predicted orbit. The much larger error in inclination will take more time for SES 14 and Al Yah 3 to overcome, and both satellites have started maneuvers to reach their final planned geostationary orbits. The Airbus-built SES 14 satellite uses plasma thrusters to adjust its orbit. The high-efficiency, low-thrust engines fire nearly continuously to gradually nudge the spacecraft higher and closer to the equator. SES 14 was expected to take five months to reach its operating orbit after an on-target launch. The Ariane 5 launch anomaly will add around four months to that timeline, SES said, but will not affect the communication satellite’s planned 15-year lifetime. The satellite will settle into geostationary orbit at 47.5 degrees west longitude to provide aeronautical and maritime mobility connectivity, wireless communications, broadband delivery, and video and data services over North, Central and South America, the Caribbean, the North Atlantic and parts of Europe, replacing the NSS-806 satellite for SES of Luxembourg. The craft hosts a secondary payload for NASA named the Global-scale Observations of the Limb and Disk, or GOLD, instrument. 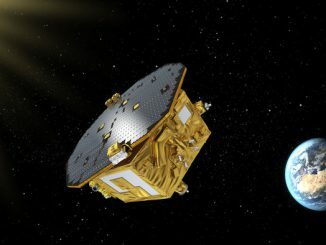 The GOLD instrument’s $66 million mission — broken down into $53 million in construction and development costs and a $13 million operations budget — will study the ionosphere and thermosphere layers in the upper atmosphere, where influences from solar activity and Earth-based weather systems combine to affect communications and navigation around the world. Al Yah 3 is the first in a new generation of higher-power, larger telecom satellites built by Orbital ATK. The new GEOStar 3 design adds additional capability to Orbital ATK’s previous GEOStar 2 spacecraft platform. The spacecraft will support broadband Internet and data services over Africa and Brazil for Yahsat, a company headquartered in Abu Dhabi. Al Yah 3 uses a hybrid propulsion system with a conventional hydrazine-fueled main engine and smaller electric thrusters. 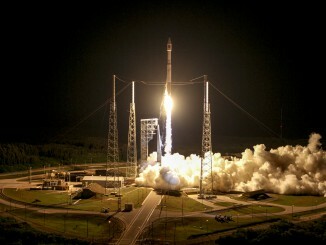 It should enter service in geostationary orbit around the middle of the year, officials said. Investigators recommended Arianespace and its parent company, Ariane Group, to improve the way engineers develop and verify documentation before a launch, and to introduce additional consistency checks to prevent the recurrence of an error like the one Jan. 25. Arianespace said the cause of the trajectory deviation during the Jan. 25 launch was “perfectly understood and corrective measures clearly identified.” The recommendations were “immediately implemented,” Arianespace said, and will be applied to the next Ariane 5 launch. The rocket’s 20-degree tack to the south led it close to Kourou, the town closest to the European-run spaceport in French Guiana. Frédérique Vidal, France’s minister of higher education, research and innovation, told lawmakers in the National Assembly earlier this week that while the Ariane 5’s trajectory approached Kourou, it did not fly directly over the town. Safety officials at the space center were receiving telemetry from the rocket at that point in the flight, and the Ariane 5’s propulsion systems were working normally. Vidal said the launcher “never proved dangerous to local people,” according to a report by Le Point, a French news magazine. Arianespace expects to resume launch services with the Ariane 5 rocket next month. The commercial mission will carry the Japanese Superbird 8/DSN 1 and and the British-owned Hylas 4 communications satellites into orbit. 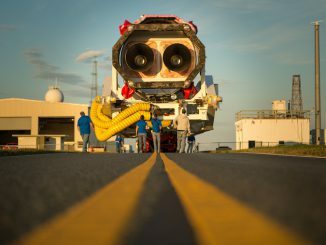 Before the Ariane 5 flight, Arianespace plans to launch a Russian-made Soyuz rocket March 6 from French Guiana with four broadband Internet satellites for O3b, a subsidiary of SES. Before the Jan. 25 anomaly, the Ariane 5 rocket logged 82 consecutive successful missions dating back to 2003, making it one of the most reliable launchers in the world, and a mainstay in the commercial launch industry. “I would like to thank ESA Inspector General Toni Tolker-Nielsen, who chaired the Independent Enquiry Commission, as well as all of its members,” said Stephane Israel, chairman and CEO of Arianespace. “The commission was able to quickly identify the cause of the anomaly and issue recommendations.